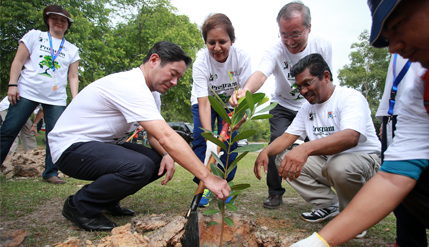 DENGKIL, SELANGOR, 14 June 2014 – Some 200 saplings were planted at the Paya Indah Wetlands here today under the Greening The Earth Programme in conjunction with World Environment Day 2014. 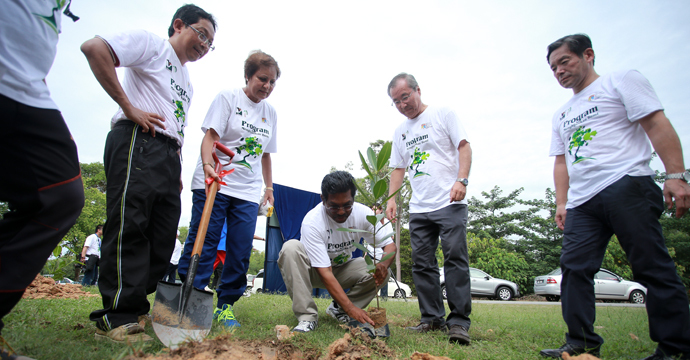 The saplings selected for their hardiness were planted in the allocated areas with the participation of more than 300 staff and students of The National University of Malaysia (UKM) and their families. They also took part in the other activities such as ecosystem discovery journey, aerobics exercise, face-painting and photography contest among others. The event was organised jointly by the Institute for Environment and Development (LESTARI), UKM; CANON Opto (Malaysia) Sdn Bhd, CANON Marketing Malaysia Sdn Bhd, Paya Indah Wetlands and the Selangor Forestry Department. Deputy Vice-Chancellor (Industry and Community Partnerships) Professor Dato’ Dr Saran Kaur Gill who officiated the programme also took part in the tree-planting. She was joined by Director of Lestari Prof Dr Mohd Raihan Taha, Senior Fellow Dato’ Shaharuddin Mohamad Ismail, Canon Marketing President Wataru Nisioka and Canon Opto (Malaysia) Managing Director Hiroshi Oshida. Prof Saran Kaur suggested the programme be made a regular annual fixture sponsored by private sector partners with the participation of the relevant government agencies and further strengthened and better structured on a sustainable basis across education, research and volunteerism. Collaborations between LESTARI and CANON has been going on for the past three years in various environmental related programmes, beginning with the celebration of the World Environmental Day 2012 at Taman Tasik Cempaka, Bandar Baru Bangi followed by river cleaning at Sungai Tekala Recreation Forest in Hulu Langat in 2013. The trees that were planted bore monikers which were more familiar as local place names, thereby showing how important they were to the history and development of human settlements in the country. The trees are not only among the vital environmental components but also have medicinal properties. Among the species of saplings planted were Beruas (Garcinia hombroniana Pierre), Melembu (Pterocymbium javanicum), Bunga Tanjung (Mimusops elengi ), Mertajam (Lepisanthes rubiginosa) and Sentul (Sandoricum koetjape). Dato’ Shahruddin said the programme is also aimed at getting children to be aware of protecting the environment through tree planting. The public, he said, also needed to know more about maintaining the natural legacy even as the nation rapidly develops. The Paya Indah Wetlands is a key ​​ecotourism area in Malaysia covering ​​3,100 hectares near Dengkil about 80 km from Kuala Lumpur. Paya Indah offers many attractions including various outdoor activities for all ages. It is also suitable as a camping site for school students and is often used during the school holidays. There are hippopotamus wading in the swampy pond, the largest crocodile in peninsular Malaysia and also a variety of water birds. Approximately 213 species of birds can be found in the Wetlands.